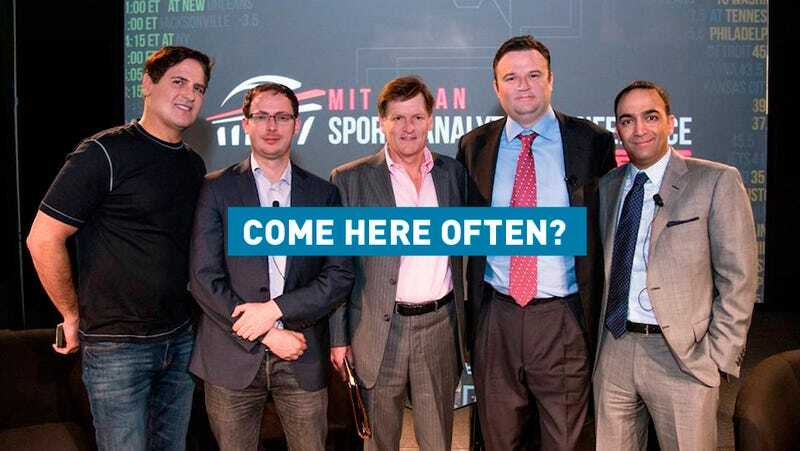 Last weekend, I went to the sixth annual MIT Sloan Sports Analytics Conference. Attendance has gone up every year, and it gets harder and harder to get a feel for who actually goes to this thing: Why were they there? Were they still all sabermetrics geeks? High-powered businessmen? To find out, I did some analysis of my own, polling over 100 people over the two-day event. I tried get a sample that represented the whole conference, asking students, executives, media, and panelists. There was about a 90 percent response rate. Nate Silver was the only respondent who gave an answer with a decimal point. The weird "more/less/average nerdy" result is an example of the "Lake Wobegon Effect," named after Garrison Keillor's mythical hometown "where all the women are strong, all the men are good looking, and all the children are above average." Another possibility is that all of the nerdiness was concentrated in a few nerds, so that most of the attendees were below the mean nerdiness level. For all of the times "geek" and "nerd" are referenced in the media about the conference, the people here weren't classically nerdy (I think you can trust me to make that distinction). This was a conference for business school nerds, the ones who wear suits to bed. Their dream job is to employ analysts, not do analysis. The word "nerd" is a brand now and that is horrifying. Update: "Unable to name anyone" should be 16%, not 15%.